If a disagreement between a customer and their bank cannot be resolved, it may be time to call in the ombudsmen and women. Independent persons – retired senior judges and ministry officials – conduct out-of-court, unbureaucratic dispute resolution proceedings to help customers who have a difference of opinion with a private bank. They establish contact between the two sides, deliberate, come up with solutions and thus help to restore dented confidence. When the ombudsmen and women began their work in 1992, it was in response to efforts at European and national level to dispense with the need for time-consuming and costly judicial proceedings. The Association of German Banks and its members – the German private banks – pioneered what was then still a new yet efficient form of dispute resolution with the aim of meeting changing consumer expectations. It was the first system of its kind in the German financial industry and since its inception it has gained a high profile and reputation. It has become an indispensable element of a proactive consumer policy of the private banks which puts customers at its heart and delivers tangible benefits. The ombudsmen and women cannot help customers who are simply seeking legal advice. Nor will they take on a case if it has already been dealt with or is being dealt with by a court of law. The same applies if it would be necessary to hear witnesses to clarify the facts. 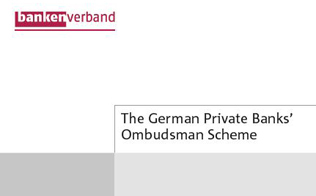 The Association of German Banks (Bundesverband deutscher Banken) has established for its member banks an entity to resolve disputes between banks and consumers.